Since video became practical to use remotely, golfers have flocked to its use to diagnose golf swing issues. I remember my first video golf swing lesson. The pro had a unit called a Sonycam that was about chest high, on wheels with a special screen that he could add grids and lines to highlight different parts of the golf swing. This rig was cool. After 15 minutes filming he showed me my golf swing and pointed out… the same problems the last 2 pros had pointed out. Honestly, the video didn’t make a bit of difference in the lesson. I still didn’t know WHY I was doing what I was doing. I still didn’t know how to tell ON THE GOLF COURSE if I was still making the same mistake or how to repeat my golf swing consistently. I understand the idea is to get the correction and try to feel what you are doing differently when you fix the problem but honestly, how many times has that method left you high and dry on the golf course? This method of correcting golf swing errors is the reason for the extreme frustration golfers experience when they have a blow-up hole after practicing on the range most of the week just so they can have a decent round on the weekend. I went through the same process for years wondering why I couldn’t get it right for a whole round of golf. That lesson that started out with video on the SonyCam with the grids and lines changed as soon as the pro turned the contraption off. You see, where most pros constantly bring you back to video your progression as you improve, this pro did not. Warm up and then get some golf swings on video. Analyze to see what is wrong. Make more swings trying to correct the problem. View video to see if you did it. More swings until you feel like you have corrected the problem. Try to figure out what certain feel you can rely on to continue swinging properly. Hit balls till your hands bleed with this new feel. How am I doing so far? This is how I used to do it. And after all of those awesome shots on the range where I knew I finally cracked the code, I would take my new-found golf swing feel out to play on the weekend, happy and confident… until the first missed shot. At that point, doubt crept in. Every shot that I missed opened the door a little more until doubt overtook me and I no longer believed that what I had thought was my breakthrough would work and I was left with nothing. From that point on my game was “hit and hope”. The simple reason for the breakdown was that my golf swing keys were never rooted in a consistent feedback that wouldn’t fade during a round. But this issue isn’t that simple or some guru would have solved it years ago. The breakdown starts with the method you are being taught. By looking at video of your golf swing or any other golf swing, you are looking at “what happens” on the outside of the body. When you have to try to mimic that same movement what do you have to do? What is the thought process? Take a minute to put yourself back into that space where you are told to do something a certain way. What goes through your mind? What are you looking for to tell you if you are doing that movement properly? Answer: You are looking for some kind of internal feedback from somewhere in your body to tell you that the movement is correct. Here’s what is actually happening: You look at some other movement and try to imagine yourself doing it. You also try to imagine how it feels. Then you try to repeat the feel that you imagined. It’s how we do everything. BUT you may not know it’s not proper because YOUR feel tells you it is proper because your feel is based on your interpretation. Using video analysis to change any movement, let alone your golf swing MAKES you try to jump the GAP between what IS on the outside and what you think it feels like on the inside. That GAP and all of the possible interpretations are the reason golf instruction perpetuates the need for more instruction leaving golfers no choice but to go back for more. The GAP in golf instruction and the reason for most frustration felt on the golf course exists in your current thought process. It’s not your fault though. It how golf has been taught since the 80s. BUT WHAT IF: You were given a shortcut. What if you were told exactly how the movement felt and that feel was exactly the same for every golfer no matter what your body’s build. You would be able to make the movement exactly as you should… Every time, from the very first time you made the movement. There is one more factor that must be considered. If you are give a specific feel, how do you know that feeling won’t leave you in the middle of a round? That’s what has always happened in the past. Your muscles get warm, cold or tired and the feel or swing key you were relying on no longer gives you the same feedback. That’s when the wheels start coming off. You even see it on the PGA tour. But there is one force on Earth the body always responds to that same way and that force doesn’t change. This force is so strong that your body has a built in mechanism to respond to it… And it responds to this force whether you like it or not. This force is so prevalent that every move you make has a component of response to it. Your golf swing has to respond to this force as well… Whether you like it or not. Most people go through life taking this automatic response for granted until they get out of their comfort zone. Ever been on top of a very tall building looking over the edge? Things feel a lot different from up there! People take the body’s response to this force for granted because they are NOT AWARE of it. Once you are aware of your body’s reaction to this overwhelming force on Earth you can actually tap into the automatic response mechanism and use it to make your movement exactly the same every time you repeat it. Imagine how well you would play golf if you knew you could command the exact golf swing you want any time you need it! How the auto-response mechanism works. How to tap into the auto response mechanism. How to control your body so the response your body makes is exactly what you want. This is a specific thought process that crosses the barriers between the conscious and subconscious mind. You can adjust this thought process to make the body respond with slightly different movement, but ultimately, you are in control of your movement. The process you use now also happens in your mind but there is one big difference. The feels you rely on with the new thought process will never fade so you can always rely on them. This new thought process is called Active Awareness. Unlike the thought process forced by video training, there is no GAP, no interpretation needed. But there is one huge issue that I have seen over the years: Golfers often learn Active Awareness and can’t believe it works because it makes the golf swing way to simple. So I guess the question I have for you is: Do you REALLY want to simplify the golf swing? If you do, Active Awareness will get you there… fast. Golfers often hit the ball well on the driving range but lose it on the golf course. This happens because of the doubt that usually creeps into their golf game. Using Active Awareness, you never have a reason to doubt yourself… As long as you believe your results come from trusting the Active Awareness process. Oh, the pro with the SonyCam? He was close. He didn’t just tell me what to do; he told me how to do it. 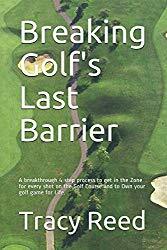 I still had to find my own feel, but his methods opened the door for me to know where to look for the answers that have freed me from golf instruction for the last 20 years.